Sergeant Michael Burkett, Officer Jared McKinney, and Officer Brandon Zwick chose a Tony's Brick Oven Pizzeria in downtown Gulfport in part because it was so close to the PD where they were training. Image courtesy of Sergeant Michael Burkett. A small group of officers with the Pass Christian (MS) Police Department recently took a quick lunch break while attending a Fentanyl class at Gulfport PD. Sergeant Michael Burkett, Officer Jared McKinney, and Officer Brandon Zwick chose a Tony's Brick Oven Pizzeria in downtown Gulfport in part because it was so close to the PD where they were training. "We ordered our food from the friendly waitress and were promptly served," Burkett told POLICE Magazine. "I had ordered the Italian sub and it was a delicious blend of grilled peppers and cheese over salami, capicola, and prosciutto on Focaccia bread. I plowed through my sandwich while cutting jokes to cheer up the younger guys." Burkett said that the chef suddenly appeared at their table with the check with a solemn look on his face. "I thanked him and he said 'you're welcome.' I told the guys I was picking up the check, being the oldest cop—tradition, right? 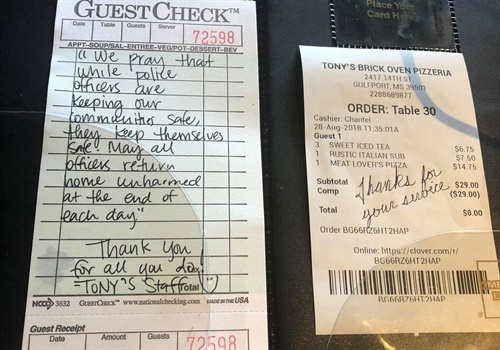 When I opened the checkbook, there was a receipt that showed a zero balance and a handwritten note from "Tony's Staff" stating that they prayed for all police officers to return home safely each day." "We pray that while police officers are keeping our communities safe, they keep themselves safe!" the note read. "May all officers return home unharmed at the end of each day. Thanks you for all you do! —Tony's Staff." Burkett laid the open checkbook on the table so they could see the note and snapped a picture. He then posted the image on Facebook, where it's been shared by more than two thousand people. "I couldn't believe the thoughtful gesture of picking up the lunch tab for three people AND taking the time to write such a loving message to three strangers who were not in even in uniform—we were in casual class attire," Burkett told POLICE Magazine. "I thanked the chef and we tipped the waitress. I put the photo on social media to let people know how wonderful the staff were, and let it be known this restaurant was a friendly haven for first responders. Luckily, my post was shared a lot and the local media shared the story. I hope the restaurant thrives and I repay their kindness."